An opposition site says the operation has had immediate success, with capture of territory and heavy casualties among Islamic State fighters. The top UN official for Palestinian refugees traveled to Syria on Saturday, amid the fighting and humanitarian crisis in Yarmouk in southern Damascus. Pierre Krähenbühl, the of the UN Relief and Works Agency, is pursuing “an urgent mission” in coordination with Secretary General Ban Ki-moon, the UN said. Yarmouk’s 18,000 remaining residents, most of them Palestinian refugees, has been under Syrian military siege since July 2012. The crisis was compounded on April 1 when the Islamic State entered the area, fighting a Palestinian militia and rebels, and took over most of the camp. 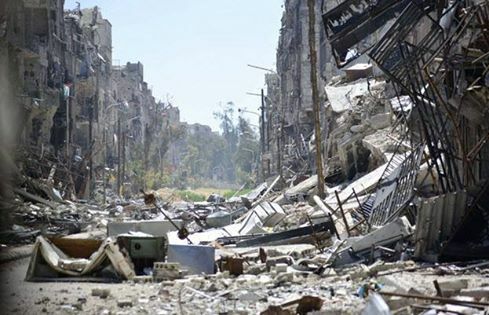 Since Thursday, both Ban Ki-Moon and UNRWA official Chris Gunness have warned that Yarmouk is a “death camp” which is “in the lower reaches of hell”, with food, water, and electricity cut off. Gunness said that Krähenbühl would try to visit areas close to the camp to interview some of the hundreds who have managed to leave since April 1. He will consult with Ramzy Ezzeldin Ramzy, the UN’s deputy Syria envoy, who was sent to Damascus on Friday. Gunness also said Krähenbühl will seeking ways to communicate, at least indirectly, with fighters of the Islamic State “to secure humanitarian access to civilians”. Catholic priest Michel Oubaji has been killed by a regime barrel bomb in Aleppo, days after he met Islamic Front rebels for Easter. Oubaji led the St Elias church in the opposition-held Maadi area of the divided city. 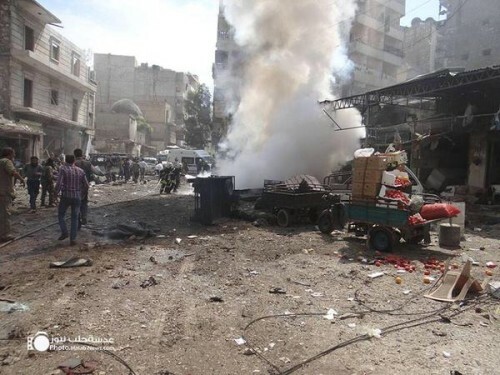 Activists said on Saturday that more than 20 people were killed in a regime airstrike on a market in the area. Fighting has surged on the ground since Friday, with rebels attacking regime checkpoints in several districts. State media said at least nine people were killed and scores wounded by rebel rockets and mortars.